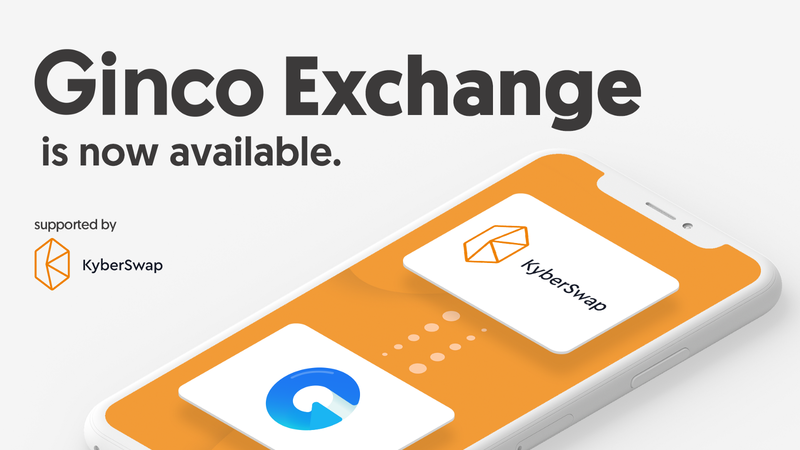 Ginco Exchange (KyberSwap) is now available. Ginco’s version update has been made on December 18th, 2018. The followings are the updated features. We have updated our design of our home screen, sending/receiving screen, portfolio, etc. to the more sophisticated version, without sacrificing the ease of use. Furthermore, we have made adjustment on icons and illustrations. This is how the Ginco 2.0 looks like. KyberNetwork has been one of our most important strategic partners. After launching our partnership back in April, our dev-team has been working hard to provide the smoothest exchange experience in the history of crypto wallets. We are proud to announce that beginning today, the latest version Ginco will have natively-integrated KyberSwap’s decentralized exchange protocol. Easy to use: Our native integration of KyberSwap has created the easiest in-app exchange experience for a crypto wallet. Safe and secure: Our users can exchange their digital assets inside of their decentralized wallet. Enjoy a safe exchange experience knowing your private key is securely protected inside your smartphone. Low fees: KyberSwap is a decentralized exchange protocol. Compared to the existing centralized exchanges, KyberSwap allows you to trade cryptos with extremely low fees. There are now Wallet, Portfolio, Notification, and “Exchange” tabs in your Ginco app. You can find them on the bottom of the home screen. Exchange tab is available from the bottom section. KyberSwap’s decentralized exchange is now available inside your wallet. Enjoy safe and secure trading with Ginco. You could exchange your tokens like this! The above graphic illustrates how one would exchange ETH and ERC20 tokens. Stay tuned for additional exchange features currently in the works. Ginco continually strives to make your crypto experience the best available. ※Please note that due to legal reasons, this function is only available outside of Japan and the United States.